When looking for the professional’s first choice in extractors, you won’t find a more comprehensive line of carpet extractors anywhere. We offer the features and power to handle any size job, from automobile detailing to heavy-duty carpet cleaning. First in the lineup of our extractors are the box extractors. These models offer hand-laid fiberglass, heavy duty construction and workmanship at a cost that is within your budget. The portable box extractor’s durable construction provides machines that are long-lasting and will continue to provide professional results for years to come. New to the extractor line are the Upright models which feature waist-high control switches, a transport handle at stand-up height, and large stair climbing wheels to take you anywhere you need to go. Our heated extractors feature an exclusive in-line heater and “The Insider” — the solution line and vacuum line in one! Also in our extractor line are self-contained extractor. Self-contained extractors offer quick and easy cleaning. For convenience you can’t get any easier than a 9 Gallon Self-Contained Extractor. You get maximum productivity with the added flexibility of attaching additional tools for cleaning spots, stairs and upholstery. The 9 Gallon Self-Contained Extractor provides superior cleaning power with a floating brush head that maximizes agitation and leaves the carpet cleaner. You never have to worry that you don’t have the brush at the proper level – it needs no adjustment. 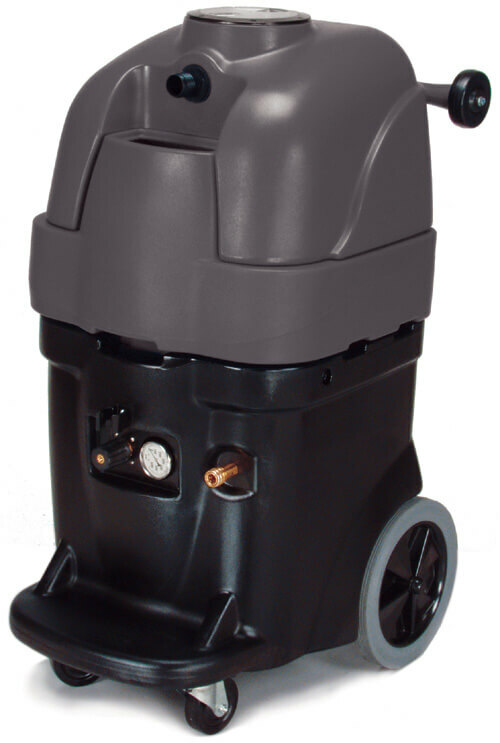 The powerful 1300 RPM chevron style brush agitates and removes soil other self-contained extractors leave behind. Solution is delivered at 100 PSI through two spray jets for even application. Clean everything from delicate drapes and upholstery to deep, embedded dirt with this powerful upright carpet extractor. 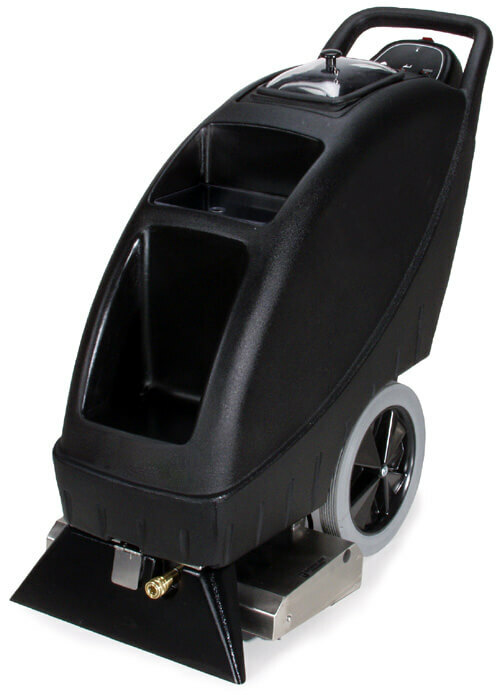 With the power and performance for superior cleaning results, our upright extractor line is the perfect portable for any carpet cleaner or in-house cleaning crew whether you are looking for an economical unit for starting in the business or a seasoned professional looking for maximum cleaning performance. Heavy-duty construction combined with the highest quality components makes the upright extractor perfect for busy, on-the-go professionals. Add heat to your cleaning arsenal with our hot water carpet extractors! Hot water adds cleaning power by dissolving many types of soiling and actually reduces the levels of biological contamination in the carpeting. A hotter cleaning solution temperature sanitizes carpet and allows the carpet to dry faster.